NASA astronaut Ricky Arnold snaps an incredible shot of Hurricane Hector moving west, south of Hawaii. 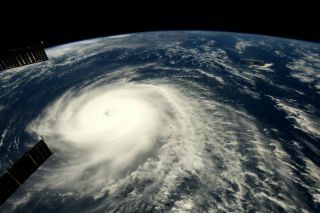 Hurricane Hector will pass just south of Hawaii, causing some pretty rough surf for the islands — and astronauts have captured some pretty incredible images of the raging storm. Hurricane Hector continues to travel but will not directly impact the Hawaiian Islands, according to a report from ABC News. Forecasters continue to track the hurricane as it moves south of Hawaii. Yesterday (Aug. 8), NASA's Aqua satellite passed over Hurricane Hector and collected infrared data that allowed forecasters to find the most intense regions of the storm. NASA astronaut Ricky Arnold has also been watching Hurricane Hector move and change from space. He tweeted his own photos of the storm yesterday, saying, "#HurricaneHector continues to strengthen as it moves closer to #Hawaii." The Suomi NPP satellite — a collaboration between NASA and the National Oceanic and Atmospheric Administration (NOAA) — has also captured some striking images of the moving hurricane. The satellite got nighttime and infrared images of Hurricane Hector as it strengthened. Although the storm will not directly impact Hawaii at hurricane strength, a tropical storm warning has been issued for Hawaii County, according to NOAA's Central Pacific Hurricane Center. This warning means that, in Hawaii County sometime today, officials expect there to be tropical storm conditions, including winds of 39 to 73 mph (63 to 117 km/h) off the coast. Sustained winds could reach 120 mph (195 km/h), with gusts even higher, according to a statement from NASA. NASA's Aqua satellite found the coldest temperatures and most powerful parts of Hurricane Hector. This image shows the satellite's reading on Aug. 8, 2018, at 7:45 a.m. EDT (1145 GMT). Heavy rain is also likely, according to data collected by the Moderate Resolution Imaging Spectroradiometer (MODIS) instrument aboard NASA's Aqua satellite. MODIS found that the cloud-top temperatures in the most intense parts of the storm were relatively cold (minus 80 degrees Fahrenheit (minus 62 degrees Celsius) or colder, indicating a likelihood of heavy rain associated with the storm in areas of Hawaii, according to the statement. The Suomi NPP satellite captured this infrared image of Hurricane Hector on Aug. 4, 2018, after it had been reclassified as a Category 3 hurricane. Hurricane Hector's center continues to move west at around 16 mph (26 km/h), south-southeast of Hilo, Hawaii, according to the statement. The hurricane is expected to continue this movement through tonight.